British Airways will debut a new Club World business class seat on both its Airbus A350-1000 and Boeing 787-10 jets in 2019, and may refit the seat to some of its existing fleet. “We do believe we have to consider some retrofitting” Cruz told Australian Business Traveller at the airline’s launch of its new Club World meal and sleep service. PREVIOUS | British Airways has opted for evolution rather than revolution when it comes to the new Club World business class seat for its forthcoming Airbus A350 fleet. 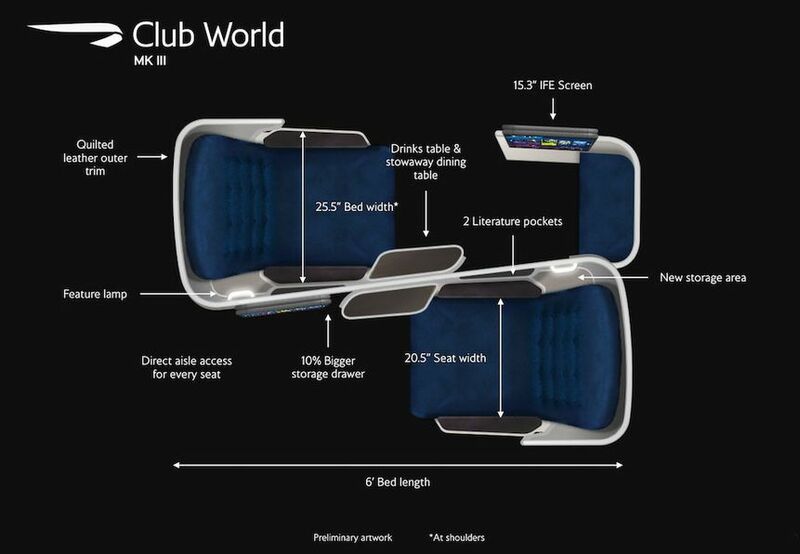 Designs for what the airline describes as its Club World Mark III seat – detailed in leaked internal BA documentation seen by Australian Business Traveller – indicate the British flag-carrier will keep the alternating foward-backward layout of its current business class. However, improvements to key aspects of the seat should boost its appeal to high flyers. Foremost among them: all passengers will now enjoy direct access to the aisle, instead of having to gingerly step over or around their neighbour. 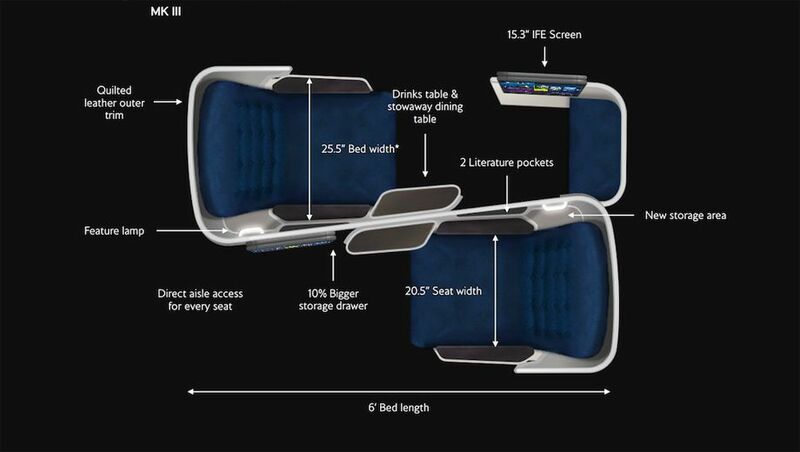 Australian Business Traveller understands that the seats convert into a fully flat bed measuring from 6'1" (185cm) to 6'4" (193cm) depending on if they are located at a window, aisle or middle pair, with a press-button recline into a relaxing 'lazy Z' position. A new storage cubby lurks beneath the armrest of each seat, in addition to a slightly larger storage drawer, while manually-operated screens provide privacy or sociability between seat pairs. The inflight video screen is almost 50% larger, having been upsized from 10.4 inches to a high-definition 15.3 inch display. The new seat design, which plays up BA's palette of blue and silver, is both more stylish and spacious than the current second-gen Club World seat (shown below). 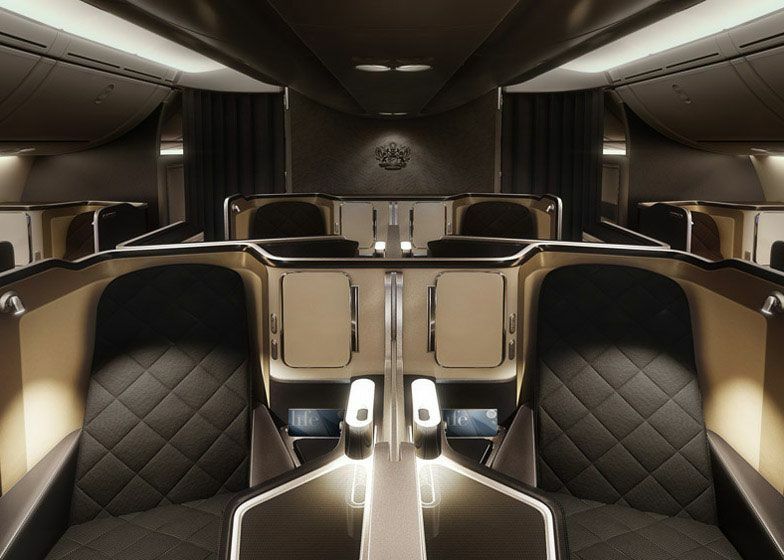 The leaked design matches up against a UK patent application lodged by British Airways and credited to BA Design Lead Peter Cooke and Paul Grader from London design firm Forpeople, which most recently worked on British Airways' Boeing 787-9 first class cabin and suites (seen below). Mockup illustrations and diagrams from that patent application – while based on an earlier, less-refined seat concept – give a better idea of how this all comes together in the cabin of the Airbus A350. 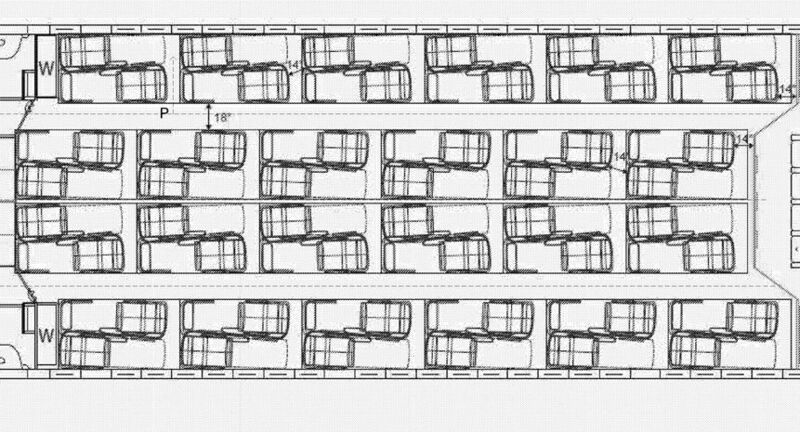 British Airways is also retaining a 2-4-2 'high density' layout, although this benefits from the wider cabin footprint of the A350. ... using a different mix of orientations for the paired seats. British Airways will begin flying the long-range Airbus A350-1000 from 2018, with 18 of the advanced jets on order and options for 18 more. Approached by Australian Business Traveller for comment, a British Airways spokesperson said “we regularly see speculation around what the next generation of our seats will look like, as we develop a lot of ideas with a range of design agencies. We often patent these ideas which is one driver of that speculation." "As and when we’re ready to announce the seats for the A350s, which are not due to arrive until 2018, we’ll do so." Earlier this year British Airways CEO Alex Cruz began tamping down expectations for the A350's Club World seat, saying it is not "ultra-revolutionary" and the design would focus more on incremental changes. Speaking with UK media, Cruz added the seat would not be retrofitted across BA's long-range international fleet – such as the Airbus A380 and Boeing 777-300ER and 787 Dreamliner fleets – because "it doesn't appear to be sufficiently revolutionary." I wouldnt actually be surprised if it is..following crew training. Frees up less efficient 77Ws to operate shorter routes to North America. Obviously it is unfair to comment on just drawings from a patent application, but, doesn't that look... rather congested? Personally, when I fly business, I do enjoy the exclusive aspect of it. Also, I'm not a fan of flying backwards. When UA used to fly the B777 to Sydney I didnt mind flying backwards. Didnt notice any difference only when taking off and landing. i cant travel on a train unless facing forward but when i was the EY A380 rear facing seat did not feel a thing it was really comfortable and i love it and would do it again! you dont feel any different when flying that fast. Airplanes are completely different - you cannot sense what direction you travel after take-off and before landing. A pity that BA went with this design, just as other airlines are moving to suite-style J. This is really premium economy plus. On another note, impressive editorial independence from AusBT - running BA promo spreads one day and publicising leaks the next! Oh dear more awfulness from BA! 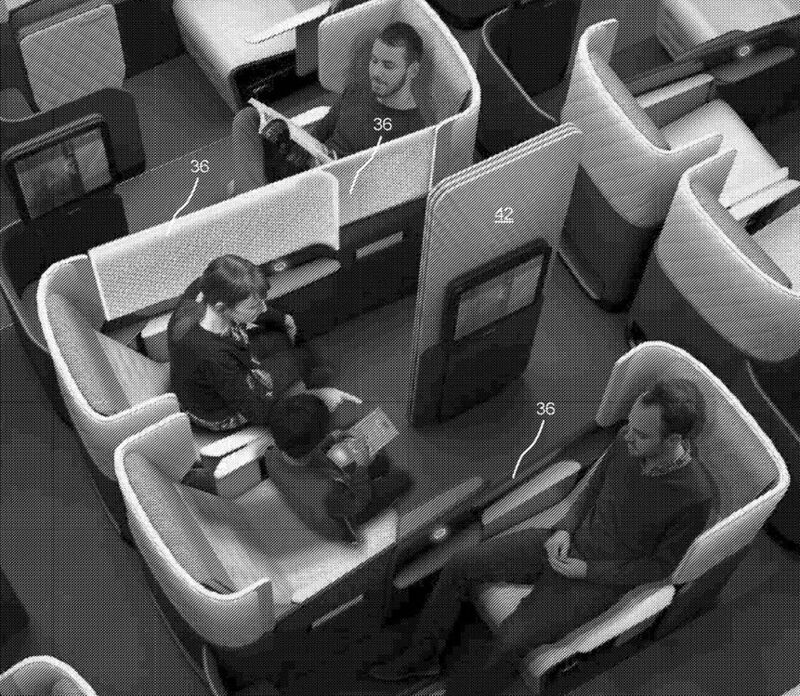 What a lost opportunity, they could have made their First seats their business seats and then introduced a true First Class. BA has so much captive premium traffic out of London that they don't really need to be competitive. They know business travellers will take a non-stop with a bad product over a connection with a good one. Of course, if Brexit destroys the UK financial sector that may all come to an end. Yeah we need to stop panicking, the most that will happen is a small two-year recession then the UK will be back in business as it will have new agreements with the likes of US, China and Australia. No one in the EU is gonna halt trade with the UK, they would be dumb to do so. Wider than what? The A380, 747 and 777 all have 2-4-2 on BA and all have wider cabins than the A350. The 787 is 2-3-2 and is narrower than the A350, so the A350 has the narrowest cabin of any with a 2-4-2 layout. It's an improvement as it addresses the biggest objection to the product, but it is designed to make money on the Atlantic, as it probably will still do for some time. 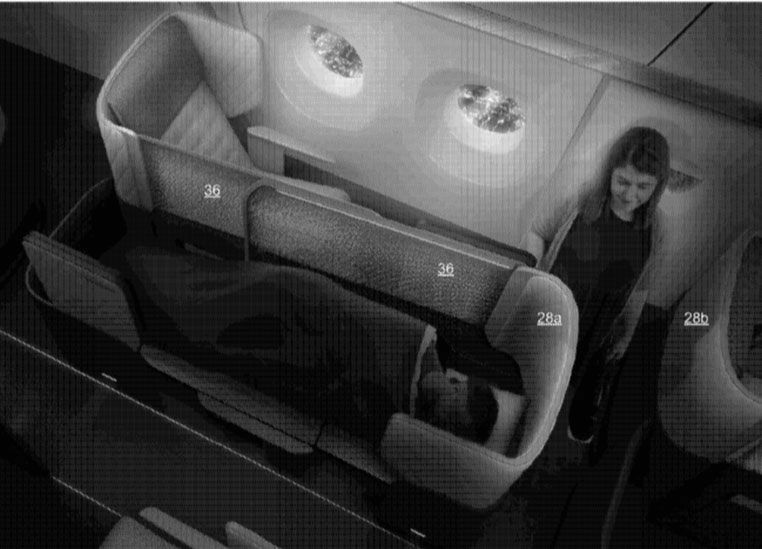 So... more bed length, more width, more privacy and direct aisle access for all seats. A great improvement! Good work BA! Please bring this upgraded product to Australia ASAP! Have there ever been any designs with seats facing sideways? I think that could be a good design. traveller99 there are planes with herringbone arrangements (I think Cathay is one) which is about as sideways as you can get before haivng no space for aisles. This has potential to be a forwards-backwards Apex suite of sorts (Japan Airlines, Korean Air, Oman Air etc. ), let's hope that they get those partitions up!! What's with airlines opting for backwards facing seats? It doesn't sound hugely progressive. True, they don't feel different in the air but people still won't naturally gravitate to them. JAL, I think it is, do a 2-2-2 configuration with all seats getting aisle access - its perfectly possible to do with all seats forward and still fitting lots in. Credit to BA for good seat width and, I hear from those who've flown their latest J and F, comfortable cushion but i'd love to see an end to this 2-4-2 melarky. Still, between the UK and US, BA would always be my first choice on their B787 or A380, they still beat the American products on service, seating, plane and food. Hey, greed is good at 8 across,maybe they should try Boeings patented 12 across!Then you could travel from a shoe box into a sardine tin, all for the price of a business class ticket. I much prefer to travel with airlines that think about me,instead of their shareholders and travel business class just 4 abreast. Backwards or forwards, who cares? But BA's J config is rubbish, even though the seat itself ain't bad at all. It's just too congested and one can usually feel a person exiting behind one's pod: bump, bump, rumble, rumble. Window seats are bearable but the rest are like flying in a Japanese capsule hotel only for about 500 times the cost. And the soft product is always, always very iffy, not much better than a Japanese convenience store (to extend the simile) at its worst, like DJ's food hall at best. Nice to see the biggest problems addressed (climb-over or be-climbed-over, lack of storage). It'll still be a tight squeeze, but the worst is that it won't be retrofitted to existing planes. Personally, I'm fine with backwards-facing seats. I get nauseous riding backwards in trains, or in a car looking inside or reading, or in a bus in the back, but never a problem flying backwards, aside from taxiing. Much prefer the herringbone config used by other carriers.......BA is going to be last choice for me. I travelled on BA A380 in business class from Hong Kong to London and London to Singapore earlier this year. I chose BA over other airlines because I like the A380 configuration on other airlines. I will NEVER travel BA again except on short hauls to Europe. It was a 2/3/2 configuration meaning 7 seats across so it felt cramped and quite claustrophobic. My husband who is over 6ft was on the window and because of the bulk head struggled to get past the feet of the sleeper in front as he had to bend down very low and then lift his legs over - it was ridiculous and unacceptable for a full paying customer. I am pleased to hear that they are reconfiguring the seats but from what I can tell on the plans it doesn't look any less congested. I repeat - I am never flying BA on a long haul. I sooooo totally agree with you .... NEVER AGAIN. Did the same flights virtually, HKG/LHR/HKG - A380 both ways. QF Business beats this hands down! Which seats would be at 193cm and which seats would be at 185cm? You dont really say, other than "depending ...". What would be the guess ... window and cramped middle two at 193cm? Minimal flat areas to place anything. I'm with others - wouldn't pay for the seats, but acknowledge that it's easy to find BA J award seats. 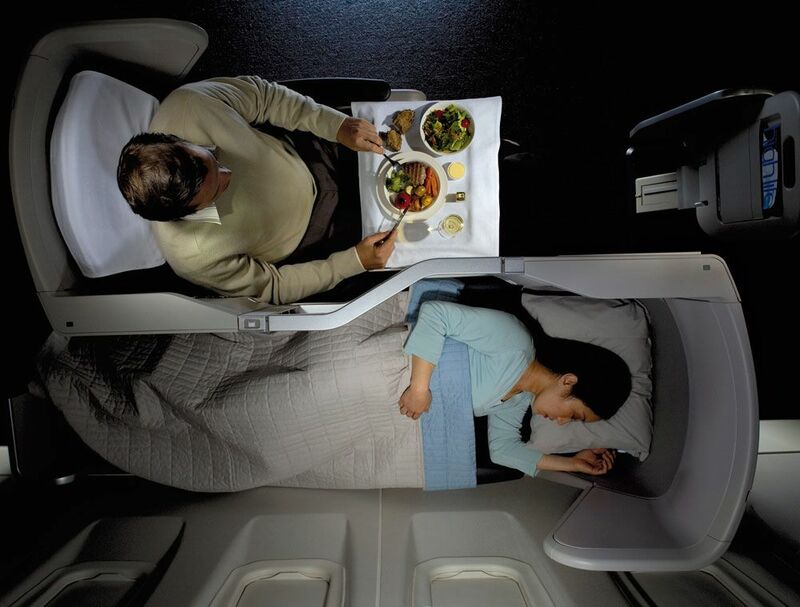 Actually I like BA design far better than QF one (I am talking about old one, not new on A330). Though to get most of it one should choose seat carefully. However I agree that nowadays this Yin-Yang approach more suitable for PE than for Business. I quite like BA's existing J seats - especially the window seats, where you have plenty of storage and a lot of privacy. Direct aisle access in the new config fixes the only real problem. FAR superior to the QF Skybed, though I rate the QF A330 J suites better than the BA version. Actually looks like a PE layout more than a business layout. Why persist with the Club World format? Almost every time you fly the "Nose to Tail" format long haul you get the unfortunate experience of having a flatulent person in the next seat for 24hrs. So apart from being packed like sardines, you guaranteed to get that specially priced CW (or was that WC?) smell. AY,CH,CX,QF,SQ are so many better ways to fly. Let's be VERY clear. This design is by no means confirmed as the option BA is going to go for. CEO Alex Cruz said "“We have made a decision to move away from the Club World seats. The time has come to change and the decision has been made. It’s going to take a little time, and we’re not going to oversell and we will tell you as we make our decisions, but it will have full-aisle, all-aisle access for all passengers so people will no longer have to have long legs to step over a passenger when they want to get to the aisle. We will take some time to come back with all the details of how we will do that." Now that isn't wholly inconsistent with the MkIII design depicted above, but the language of "move away" implies that there is discussion about a completely new design. Now that doesn't mean it wont be what has been pictured (it is an obvious step, but probably the last step that can be taken without a wholly new design), but there at least appears to be some awareness that it isn't competitive. Looking at AA, UA Polaris and the new Delta (bearing in mind BA's bread and butter on long haul is USA-Europe), it's fairly obvious that MkIII isn't competitive. I gave up on BA (iro long haul) some time ago because of its rear facing seats and the feeling of being cramped. I know its illogical but I hate travelling backwards, even on aircraft. The two centre seats look dreadful and I would hate to wind up in one of them. When I am paying J class prices I want a J class product. Other airlines understand this and provide a better product so I fly with them. This proposed 'new' offering has done nothing to persuade me to return to long haul BA. Why do people keep saying other airlines offer 4 seats per row compared to BA's 8?! Do you not realise that BA have significantly fewer rows compared to other airlines because herringbone or staggered seating overlaps each other. Other airline seats can be very claustraphobic in a different way by having little cubby holes to put your feet in, compared with BA's having full height for the whole length of the pitch. The trade off is a lack of table space, but BA have tried to compensate for that with this new update with the small table in addition to the main table. I grant that BA seats might be slightly narrower than other carriers but i think people get carried away when criticising the product. The improvements to this seat design will make the product much more competative than the current offering, and because it is a unique product offers a real alternative to other airlines depending on what you like. This is very much like the current set up. Claustrophobic and flying backwards (?) well, I am not a fan. I did JFK to LHR in the setup, sim to the picture above, where the woman is sleeping (backwards) and the gent is eating next to her. Worst flying experience of my life. I have not flown BA since and never will again while they configure a premium cabin like this. Comment on "British Airways: new Club World business class seat for 2019"